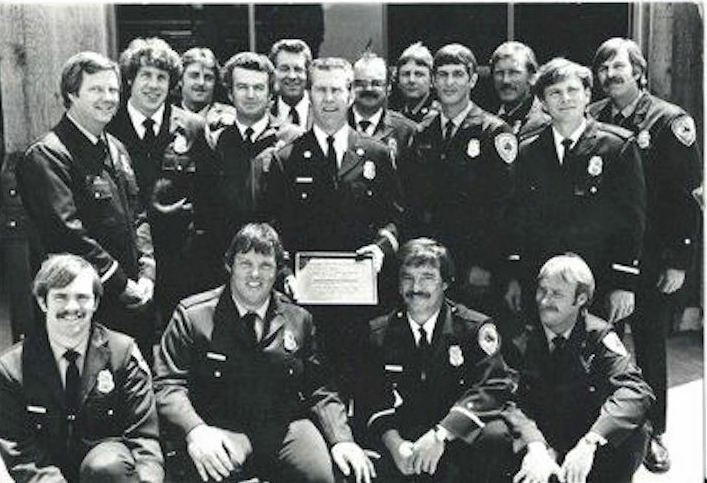 This department served for many decades and today is part of the Southern Marin Fire Protection District. The full story is coming soon. A group photo taken at the dedication of the new fire station (l - r back row): John Flemming, Brent Schacherl, Dave Fenzl, Darryl Anderson, Ron Shafer, Bob Quale, Carl Carlson, Mike (Robert) Stone, Peter Toews, Donny Mackin, Don Morrison, Robert Rames. (l-r front row): Tim Exline, Roger Buchholz, Bob Souza, Bob Rutherford.